A team of engineers and product experts from Google, Facebook and Uber have come together to create Bee Token – the first Airbnb ICO on the blockchain, currently smashing our Telegram Tracker. Boasting an impressive team led by co-founder and CEO Jonathan Chou, who is a former lead at Uber Security & Fraud, and co-founder and CTO Tony Tran, a former engineer at Uber, Bee Token aims to provide a decentralized home sharing platform. Currently building Beenest and the Bee Protocols on the Ethereum blockchain, the ICO offers bank-level security. It also aims to eliminate the middle man. Furthermore, the Bee Token aims to return the power to the users and contributors, by making sure there are 0% commissions. Additionally, Bee Token believes that the capitalisation of sharing economies should be enjoyed by the people in its community. What is the Beenest platform? Beenest is a home-sharing platform for hosts to list their homes and for guests to find accommodation. Built on top of the Bee Protocols, it provides users with rewards including network incentives, commission-free transactions and bank-level security. What are the Bee Protocols? 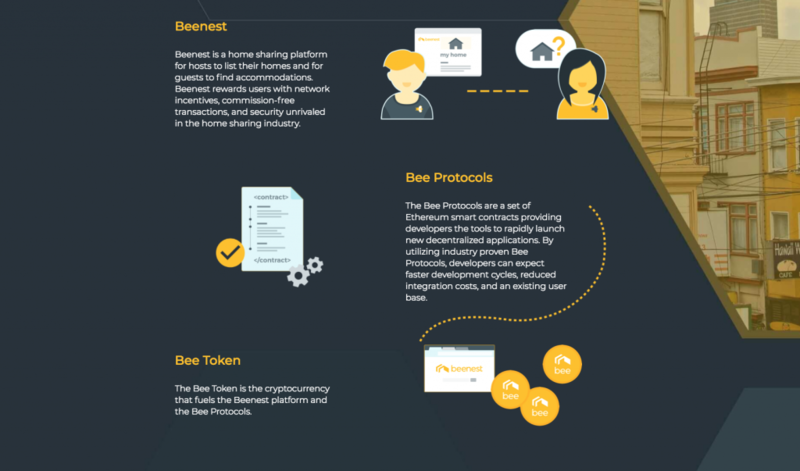 Made up of three protocols – payment, arbitration and reputation (P-A-R) – the Bee Protocols are designed so that centralized sharing economy applications, such as Couchsurfing or Airbnb, can hook into their protocols and tokenize their offerings. The company believes that the Bee Protocols will greatly benefit Ethereum ‘by providing solutions for trustless decentralized payments and the inherent problems of any network: conflicts and malicious users’. Following the best engineering practices, they are ‘generic, cost-efficient and seamless’. Additionally, all the Bee code is public and open source. Why is Bee Token ICO on the blockchain? Bee Token explains in its whitepaper that peer-to-peer sharing economies such as Airbnb extracts a high commission fee from the users. Additionally, they believe that the rise of Airbnb from $0 to $31bn is ‘only enjoyed by a select few’. This is why Bee Token aims to decentralize the home-sharing platform. To reward the customers, or what they describe as the ‘invaluable contributors’ of these platforms. “When market demand increases for a good or service, network participants should benefit when new equilibrium prices are reached,” the whitepaper says. “Instead, companies arbitrage these shifts to capitalize on value added by their community. Bee Token’s all-star team, plus the hype received from both influencers and a general audience, makes us rate Bee Token as a Stellar ICO. Their hard cap of $15M is modest, but it’s worth noting that Bee Token has given quite generous bonuses in their pre-sale: up to 40%. The bonus tokens will be locked for 1 month though, which reduces the chance of early investors dumping them early. 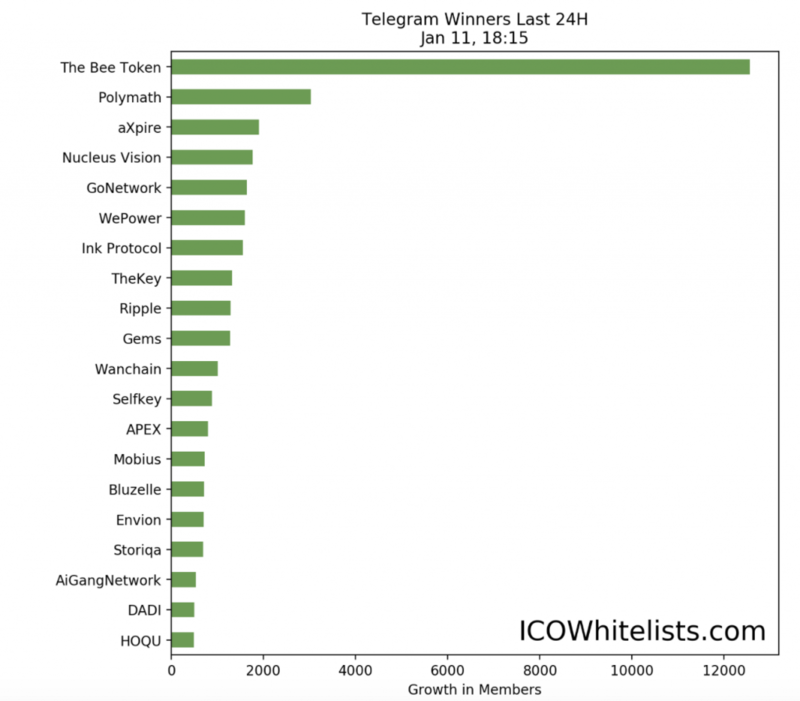 To keep updated with the performance of Bee Token and other ICOs, check out our Telegram Tracker. Read more about our ICO rating system here. I wish to contribute to Airbnb ICO. Please send me the link so that I can contribute.